It is said that the future of the Carnival of Viareggio depends on the Carnival Citadel; It is a large structure, built in the north area of the city of Viareggio, with 16 hangars, a theatre and a multimedia museum, which will allow everyone to enter the magical world of Carnival all year round, to understand its up to now inaccessible secrets and shades. The structure allows the magicians of Papier Mâché to express themselves better artistically and to show the constructions to the public not only during the festive period. A museum and a multimedia “lane” have been built inside the structure in order to illustrate the story of the carnival of Viareggio to the visitors. The Citadel is also a cultural and entertainment centre with open spaces that can be used all year round. A large urban park receives the City of Carnival. The floats workshops turn the urban park into an animated park, animated by carnival presences linked to an original craftsmanship and artistic activity of great importance. The city of carnival comes to life and defines itself as a structure of great scenographical value. In this complex, one notices immediately, even from a distance, the elevated area located around an elliptical square, axis of future developments, that underlines even more the emergence of the citadel from the land. 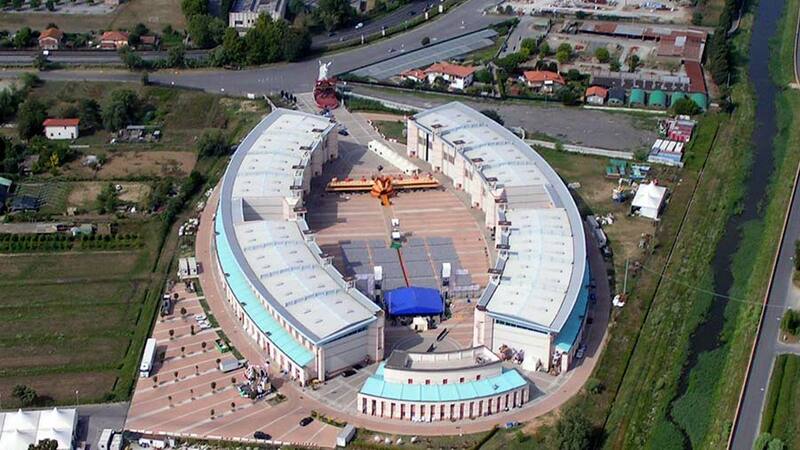 The complex composed of the16 hangars and other buildings forms a square, ideal for parties and shows. The doors from which the floats get out open on this square; when these doors are closed they represent the drop curtain of a special theatre; when they open, they unveil on stage, in a magical contemporary vision, 16 extraordinary actors, i.e the carnival floats. If the square is the place of parties and shows, the external perimetral road, where the artists have their shops, is the meeting place between the park’s visitors and the craftsmen at work. The Citadel is composed of the hangars-workshops, two service centres and the Museum building.